Regan: Can Credit Unions beat payday AND keep lending ethically? Can Credit Unions beat payday AND keep lending ethically? Firstly, I need to put a few corners on this subject. I don't think lending and borrowing is particularly un-ethical a concept. I consider usury as a sin in the same way as I do coveting oxen (that is not at all and what a ridiculous thing for an omnipotent super being to have rules about). I struggle to see a moral difference a baker buying a bag of flour for £1, who then sells me a loaf of bread for £1.50 and a finance company being funded at 10% and lending at 15%. As a token of value for which we will swap both work and products money is useful and so in any practical way, is real. So if you're looking for an anarchist polemic against the horrors of money...you've come to the wrong shop brother. It is into this deeply practical world of lending that Credit Unions are hoping to provide a genuine alternative to Payday Lenders, their doorstep brethren and the distant (ish) cousins of the illegal loan sharks. I like the principle and principles of Credit Unions. 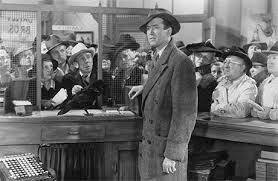 Small, Local run for their members - they remind me of James Stewart imploring his townsfolk not to withdraw their savings that are invested in each other’s houses. To take on the numbers of customers who payday lends will be a massive challenge and in meeting this challenge they will have to change. Will these changes stop them being ethical? My thoughts form themselves into 4 areas where Credit Unions might face uncomfortable decisions. Low Rates and Customers who don't pay you back. Lending to Need or Desire? Short Term borrowing is at its best meant for emergencies, a broken boiler, and car repairs. However, at their most controversial Payday loans are used for energy bills, Xmas present and all inclusive holidays. Would a CU lend for these reasons? If not how can they become an alternative? If they do, allying your frugal principles to your actions becomes more difficult. Credit Unions have about 1 million customers. In 2012 the Office of Fair Trading estimated there were 8.2 million payday customers. So conservatively, Credit Unions would have to grow 3 times to become a national alternative meet this need. That's 3 times the office space, 3 times the salaries. That many customers with modern 24/7 customer service expectations would need call centres. The regulator would expect compliance monitoring and regular audits. This stuff needs paying for. Staff needs organising and training. The same requirements for affordability assessment and responsible borrowing apply to credit unions as well as regular lenders. The skills of all these new staff would need enhancing. Good outcomes for customers would need to be demonstrated, measured and reported. All of a sudden it sounds very formal, very corporate. It’s difficult to maintain values and ethics when you don’t know each other by first name. To be big enough to take on Payday do you lose what’s good about being small? In 2013 there may be up-to £2billion of payday loans. For Credit Unions to meet only 25% of that lending they would require a huge increase in loans provided. Which would need money to lend, and as they are member funded they don’t have any. Looking at the eligibility rules for My Community Bank, I couldn't join, so building a base of members large enough to invest will be hard. There has been £38 Million provided from taxpayer funds recently but even lending each and every penny of that won't compete with Payday. This provides Credit Unions with a difficult question – Do you take outside investment to build and grow? To do so means you can really take on Payday, but if you do, and take on a responsibility to shareholders, how are you different? The alternative to external funding is to remain self-sufficient which probably won't provide enough funding to replace Payday Lenders at a national scale. But there is also a question of whether Payday customers are Credit Union Customers. Credit Unions are paragons of upper working class frugal virtue, its part of their selling point that they encourage responsible and informed attitudes to money in general. This in turn minimises the need for borrowing and increases the chances of saving. However, "sensible" is the last word that I would use to describe many payday borrowers. 30 years of un-mitigated consumerism, easy credit and cavalier bankruptcy rules have created customers who want their shiny things and they want them now. Given the choice between opening an account, putting into place a solid financial plan, borrowing just enough to augment some savings OR having the money in your hand queuing in the shops 20 minutes later, is for a lot of payday customers no contest. Having it now and taking your chances - is a temptation that Credit Unions should never provide and so there will always be a population that they will not be able to service while maintaining ethics. In winning the Second World War the allies had to do monstrous things that would seem more in keeping with evil totalitarianism rather than the principles of peace loving democracies. In appealing to payday customers can Credit Unions avoid similar practices? A very interesting read mr regars. We all like shiney things and like them now indeed. Thanks Ben. I agree with you. Credit Unions will work for sensible, frugal people. Who don't sound like PayDay customers at all! We also have to remember that PayDay is VERY popular with consumers.